"The Frank Lloyd Wright of Kansas City"
July 1, 1865: Louis Curtiss, a Kansas City architect best known for his innovation in the "curtain wall" construction of buildings, was born in Belleville, Ontario. During a 37-year career in Kansas City, he left his mark with the government buildings, railroad stations, restaurant, hotels, and residences that he designed. Rivaling his architectural accomplishments were his eccentric personality and several mysteries that captured the public's attention. Hannibal Bridge, looking northeast from the south side of the Missouri River. July 3, 1869: Hannibal Bridge officially opened as an anxious crowd of 40,000 people looked on from the shores of the Missouri River. It was a spectacular turnout for a town that just four years before only had a population of 4,000. The crowd knew that the Hannibal Bridge would be one of the most important factors in Kansas City's growth from a small frontier town into a full-blown city that outgrew all others in the region. Nonetheless, it's growth would be severely hampered without the most important form of transportation of the era: railroads. 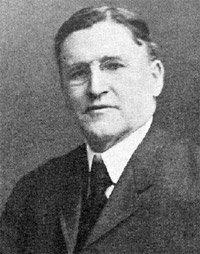 September 13, 1870: Fred Wolferman, who will lead the family Kansas City grocery store to a successful purveyor of luxury food goods (especially Wolferman's English muffins), is born in Milwaukee, Wisconsin. Thirteen years later the family moved to Kansas City, where his father, Louis Wolferman, mortgaged their home to raise $750 for the purchase of a bankrupt grocery store. At the age of 18, Fred Wolferman sacrificed his dream of becoming a physician or a lawyer so that he could assist his father with the fledgling business. In just a few years, Fred took over the management of the grocery store while his father ran a farm which produced most of the fresh foods that Wolferman's Store sold. September 26, 1872: The Kansas City Industrial Exposition attracted nearly 60,000 visitors each day, twice the population of Kansas City itself. The four-day exposition presented innovative industrial machines, fine art, floral displays, and horse races in a manner reminiscent of a World’s Fair. At the end of the fourth day on September 26, 1872, three masked men, including Jesse and Frank James, robbed the ticket office and escaped with $978. April 7, 1878: Kansas City's Union Depot opened near the stockyards and meat packers in the West Bottoms. Many observers initially considered the $410,028 building (the largest west of New York) to be excessive compared to the freight and passenger traffic then passing through Kansas City, but the city's rapidly expanding railroad connections actually overwhelmed the facility in just two years. The need for Union Depot arose after the construction of the Hannibal Bridge in 1869. January 21, 1879: Kansas Senate passed a resolution that approved the annexation of Kansas City, Missouri. The Missouri legislature refused to adopt a corresponding resolution, however, and this attempt to incorporate Kansas City into Kansas went nowhere. Interestingly, it was just one of several attempts in the nineteenth century to annex Kansas City to Kansas. The first push for the border alteration actually came from Missouri in the pre-Civil War years. In 1855, Mobillion W. McGee, a proslavery resident of Westport, Missouri, believed that if the Kansas territory annexed Kansas City and Westport it would gain thousands of proslavery sympathizers who could vote to make Kansas a slave state when it entered the Union. March 8, 1879: Isaac "Ike" Katz, who would go on to found the Katz Drug Co. in Kansas City and become a pioneer in the modern pharmacy business, was born in the town of Husiatin in western Ukraine (then a part of Russia) on March 8, 1879. Ike Katz brought customers into his drug stores with a unique business model, where customers could fill prescriptions, shop for groceries, buy appliances, and even purchase exotic pets such as monkeys or baby alligators; all at cut-rate prices. At its peak in the 1950s and 1960s, the company boasted 65 retail locations spread across seven states. April 25, 1879: The Wyandotte Commercial Gazette reported that more than 1,000 destitute African Americans had arrived in Wyandotte City (present-day Kansas City, Kansas) in just two weeks. With a total population of just 4,612, Wyandotte struggled to meet the needs of so many former slaves who had left the South for hopes of a better life in Kansas. Between 1879 and 1880, roughly 20,000 African Americans entered the Sunflower State. Most were former slaves who sought personal security, economic stability and a new start in life. The federal government's Reconstruction program in the South had officially ceased in 1877, and with it died many Southern blacks' hopes for equality under the law. January 22, 1882: Future architect William Drewin Wight was born in Halifax, Nova Scotia. In 1911, he joined his older brother, Thomas, in Kansas City, where they created the architectural firm of Wight & Wight. The firm went on to profoundly influence Kansas City's architectural landscape with prominent designs that included the Nelson-Atkins Museum of Art, the Jackson County Courthouse, the Kansas City Life Insurance Company Building, and City Hall. March 31, 1882: In an editorial, The Kansas City Star declared its opposition to the streetcar monopoly then held by Thomas Corrigan. Although William Rockhill Nelson, owner of The Star, generally preferred that the paper remain neutral in politics, he made exceptions for cases where he believed rampant corruption demanded public awareness. Nelson's ensuing battle with the Corrigan family emerged as one of the defining contests of local Kansas City politics in the late-nineteenth century.